12. About the WindPower project. The British economy will increasingly feel the impact of the Government's commitment to reducing carbon emissions including targets for greater use of renewable sources. 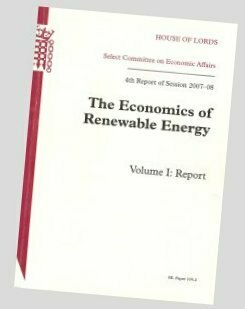 The Government describes its targets for renewables as challenging; others have suggested they are unachievable. In any event, the effort to meet them will come at a cost and, if not properly managed, risks distracting attention from other means of reducing emissions. A key phrase here is "if not properly managed". The simple fact is that the development of on-shore renewables in the UK is not being managed at all and is subject only to a very loose and poor set of planning guidelines (Planning Policy Statement 22 and its extension) which has encouraged a large number of planning applications which from a technical and economic standpoint do not bear examination. Much of the problem comes from planning decisions being made by officials (elected and non-elected) who often have little understanding about the performance of wind turbines. It is certain that this is happening in other countries too. There is an important place for wind power both on the small scale and the large scale but decisions on its suitability and practicality at both ends of the scale needs information not emotion as the basis for decision making. It is hoped that the WindPower program might make some small contribution towards achieving this. Building Research Station - a theoretical and experimental study of measuring the 'leakiness' of buildings using a transient pressure measuring technique. AB Airlines - installation of a small ten computer network with software for carrying out airline ticket accounting. Littlewoods Stores - course on managing Internet orders. Mathematical modelling of the radiobiological response of prostate cancer cells. Various web designs for local organisations. Federal University of Rio de Janeiro - development of a probe for measuring the size and speed of bubbles in a multiphase flow. Modelling of wind turbine wake flows for a planning application for a site adjacent to an airfield - private client. Collating the UK wind speed database with the post code database - private client. Department of Trade and Industry (now BERR) - multiphase flow loop specification for NEL. Prior to PelaFlow Consulting, I was variously a Senior Principal Scientific Officer (Special Merit) in the Scientific Civil Service, Head of Fluid Mechanics Department at Schlumberger Cambridge Research and a Professor of Mechanical Engineering at the University of Plymouth. In addition to commercial reports, I have written around a hundred conference and archival journal papers on a range of topics in the general area of fluid mechanics and flow measurement. Consulting work on wind turbines and other things. Although the WindPower program is reasonably straightforward to use, anyone who wishes to have an independent report on the performance of one or more turbines being considered for an installation can contact us through our Contact Us webpage and we will provide a quotation for such a report. We are, of course, interested in other types of consulting work too and so, if you have a technical problem, feel free to contact us to see if it lies within our field of competence.